Welcome to ThreadABeads LARGEST ever fully beaded ornament! This design has been in development for months and we can finally bring it to you in its full beaded glory! Around the centre of the ornament is a detailed little nativity scene with Mary, Joseph, angel Gabriel, the three kings, the shepherd with his sheep – not to mention the star of Bethlehem, a donkey, camel and palm tree! The top and the bottom of the ornament is embellished with fire polished beads and then edged in galvanized silver delica beads. Made using a form of Round Peyote the ornament is easy and simple to make. However it will take around 8-10 hours, so makes an ideal piece of heirloom beadwork. As usual with ThreadABead featured patterns we give full detailed photographic instructions and in this pattern there are 57 detailed steps, making this pattern even suitable for beginners to beading. 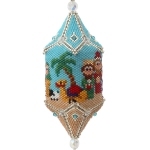 This ornament bead pattern is made using Japanese Miyuki size 11 Delica beads and round peyote is used. It is assumed the beader will be familiar round peyote, however full instructions are given. Please note the pattern may not work with any other size and type of beads. There are 22 colours in total and the finished beadwork is approximately 11.5 cm x 4.5 cm. 10 x 3mm Aquamarine, 32 x 3mm Crystal AB, 4 x 8mm Crystal AB Fire Polished Beads and required for the ornament. Additionally Polyester Wadding can be used, however this is optional not required. The bead pattern supplied is 23 pages and includes a colour chart of suggested delicas, a colour pattern and a numbered coloured pattern with full photographic assembly instructions.